A Brief History of MSA's Founding. In 1919: 18th Amendment to the United States Constitution, authorizing Prohibition, goes into effect in the United States Prohibition begins:.United States Congress establishes most of the Grand Canyon as a United States National Park, United States navy seaplane begins the first transatlantic flight The British dirigible R34 lands in New York, completing the first crossing of the Atlantic by an airship, United States Congress approves the 19th Amendment to the United States Constitution, which would guarantee suffrage to women, and sends it to the U.S. states for ratification, Treaty of Versailles is signed and ends World War. Treaty of Versailles fails a critical ratification vote in the United States Senate. It will never be ratified by the U.S. Florida Keys Hurricane kills 600 people. The Mineralogical Society of America founded - but only after a 2 year gestation period. 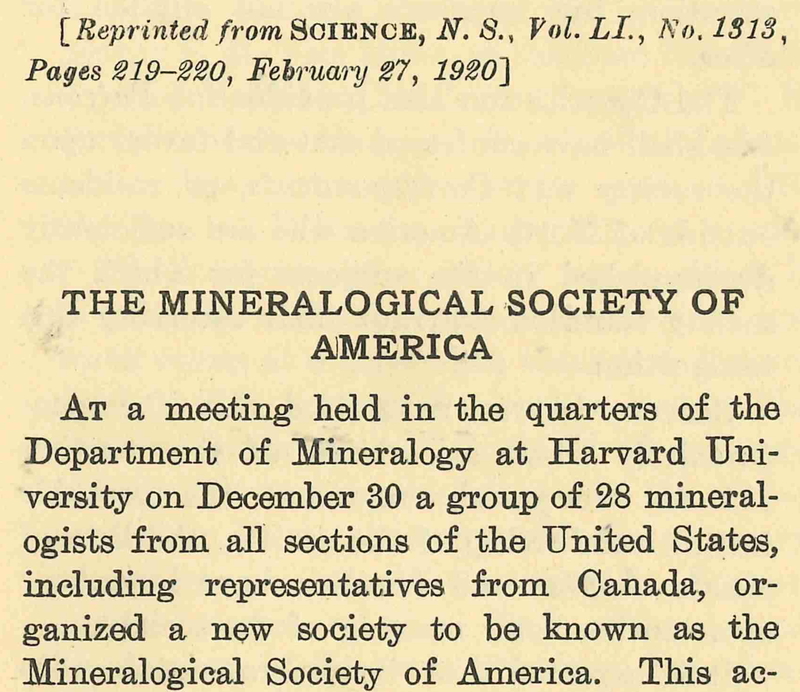 In February 1917 Edward H. Kraus (University of Michigan) circulated a typeset letter among 51 mineralogists in the US and Canada inviting them to form an organization which might be called The Mineralogical Society of America. This was a result of discussions over several previous years at the annual meeting of the Geological Society of America. The reason for founding such a society would be to stimulate greater interest in the subject and give wider recognition to the work being done in the Americas. The greatest benefit of such a society was said to be a dignified medium of an independent publication devoted exclusively to publishing of mineralogical papers. Many of the existing publications based in Europe had been unavailable since the start of the war. Of the 35 replies received to Dr. Kraus' letter by October 1917, 29 were favorable, but it was suggested formation be delayed. 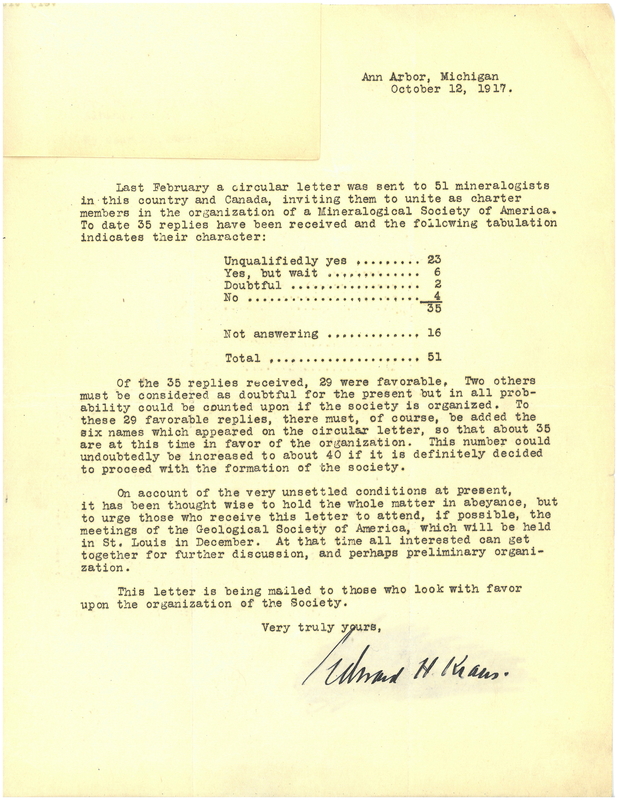 A mimeographed letter was sent by Dean Kraus in October 1917 as a follow-up, said the formation of the organization would be put on hold because of “very unsettled conditions at present”. The “very unsettled conditions” were a result of the April 1917 entry of the United States into the First World War, a war that had been ongoing since July 1914. The first opportunity to organize a society after the war was at the 1919 Geological Society of America Meeting in Boston, Massachusetts. 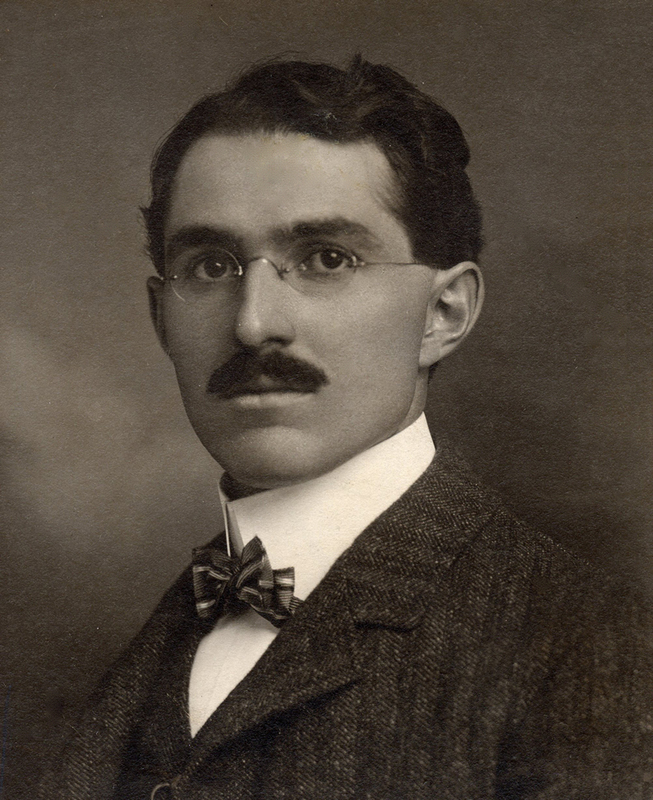 Dr Kraus restarted his efforts to form a society during the spring and summer of 1919. He wrote a draft constitution and circulated it among a few individuals for comment in October 1919. An organizational notice was published in the November 28, 1919 issue of Science. Invitation letters to attend the organizational meeting were sent December 12, 1919 to those who had earlier expressed interest in joining. Leading up to the organizational meeting, three issues occupied Kraus's attention: the name of the society, who should belong, and the promised publication. Various formulations of the words crystallography, mineralogy, petrography, society, and America were suggested. One humorist pointed out that many minerals are "colloidal" and no one seemed anxious to belong to a Colloidal Society of America. In the end, it was concluded the simplest name, Mineralogical Society of America, was the best. Initially it was envisioned that only those who had written or published would be or want to be members. It was concluded that the society would best serve the interest of the subject by having as large a following as possible. The society was to promote interest in crystallography, mineralogy, petrography, and allied sciences. Following society practices of the time however, individuals who had published results of mineralogical research would be fellows whereas members would be individuals engaged or interested in mineralogical work. 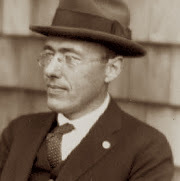 Dr. Edgar T. Wherry proposed to Dr. Kraus in a letter dated September 28, 1919 that The American Mineralogist (first published July 1916) be incorporated in the new journal of the society. Wherry felt that there would be little demand for two mineral publications in the Americas, and making The American Mineralogist a society journal would assure its future. The journal had been having financial difficulties, with any shortfalls covered by what were then significant donations from Roebling and Burrage. As it turned out, the journal was accepted as the society journal along with its original name with the subtitle of "Journal of the Mineralogical Society of America". In part, this was at the insistence of the journal founders and some of its financial supporters. The first issue published by MSA was the January 1920 issue. 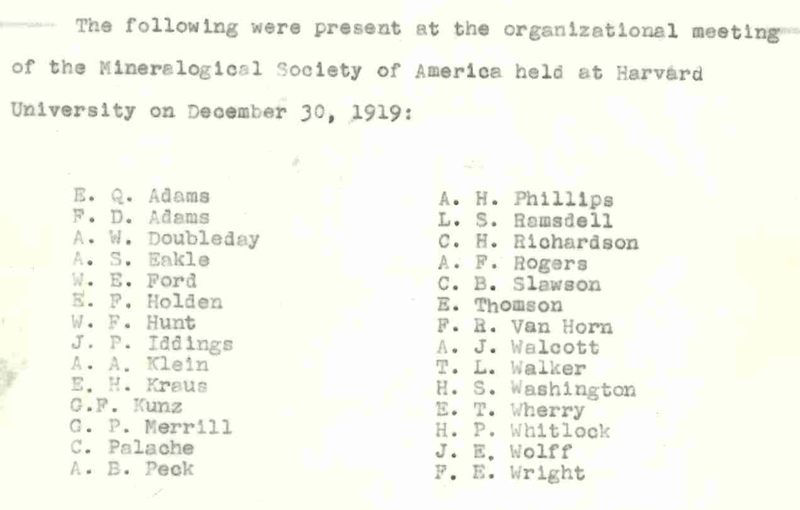 Twenty-eight mineralogists attended the organizational meeting at the Harvard University Geological Museum on December 30, 1919 and MSA came into being. The participants were also invited to view the mineral collection of Albert C. Burrage of the city in his home. This impressive collection of gold specimens, along with Bisbee azurites and malachites, subsequently found its way into the Harvard Mineralogical Museum in 1948 as a bequest of Burrage. The outcome of the organizational meeting were published in the February 27, 1920 issue of Science (page 219-220). The MSA Executive Council met the next morning, December 31, 1919 at 8:15 am. At that meeting the details of the offer to make The American Mineralogist the society journal, a list of associate editors, affiliation with the Geological Society of America, and the contents of the note to appear in Science were all considered. At 11:00 am the first MSA Council met whereat they accepted the recommendations of the Executive Council. MSA had its first annual meeting in 1920. Thereafter MSA focused its attentions on improving the journal and the financial health of the society, a task made much easier by Washington Roebling's gift in 1927, but then more difficult by the Great Depression and WW II. Except for initiating the Roebling Medal in 1937 and the MSA Award in 1950, MSA remained pretty much the same for years. Things began to change about MSA's 50th anniversary, slowly at first then more rapidly — special publications in the 1960's, short courses, Reviews, and research grants in the 1970's, Lecture Program, AMU Awards, and a stand alone office in the 1980's, Distinguished Public Service Medal, monographs, textbooks, MSA-Talk, and website in the 1990's, Mineralogy-4-Kids, Ask-a-Mineralogist, Dana Medal, Handbook of Mineralogy, GeoScienceWorld, online archive of the American Mineralogist, and Elements in 2000's.